There’s a reason the music industry has been kind to sibling acts—what’s more adorable than a family that sings together? Furthermore, if history tells us anything, they work. 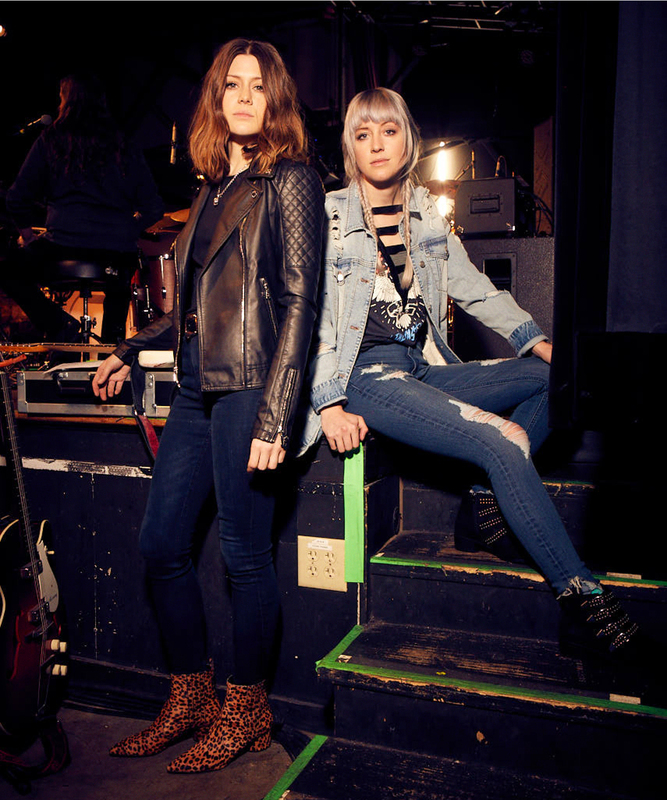 Larkin Poe, the Nashville-based rock band comprised of Rebecca and Megan Lovell, is certainly no exception. Born and raised in Atlanta, Georgia, the vivacious 27 and 28 year olds (respectively) were encouraged from a young age to pursue their musical talents. In 2010, the pair formed their band, naming it after their great-great-great grandfather, a cousin of renowned poet Edgar Allan Poe. Since then, Larkin Poe has released three albums and their latest, Peach—an ode to the fruit for which their home state is famous—has achieved critical acclaim. They’re even nominated for a Blues Music Award nomination for the “Best Emerging Artist” album of 2017. Though Megan is older and has a more intense beauty and style vibes, complete with bleached-blonde hair and blunt bangs, Rebecca is the talker of the two. With her commanding voice, Rebecca is unsurprisingly the lead vocalist, while Megan’s skills on the lap steel guitar helps carry their sound. The sisters play a total of six instruments between the two of them, something that has undoubtedly helped to build their rock and roll reputation in blues music. Naturally, the young musicians have a festival-heavy few months ahead of them, performing at Bonnaroo (for their second time), Lollapalooza, and countless other gigs across the country. Their Americana-sound and punky denim-fueled look should be right at home on the summer stage. 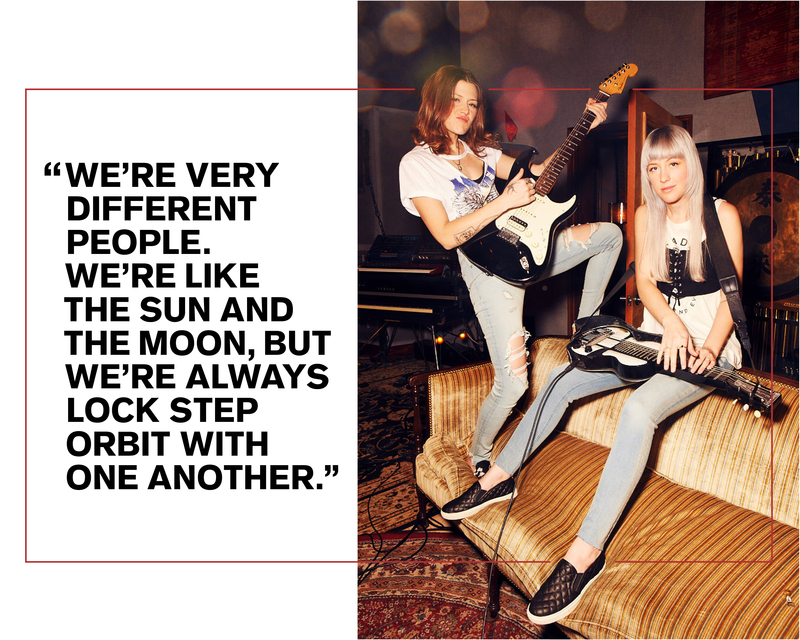 We caught up with the sister act before they go on the road, to learn about the Lovell’s life of music and love of denim. And be sure to catch our video with them below. EXPRESS: Can you tell us a little bit about how you got your start in music? Rebecca Lovell: We started playing music at very young ages, both Megan and I were around 3 and 4 years old when our mom and our dad put us in classical piano and violin lessons. Music was always a big part of our family life growing up—being from the south, there are so many music festivals. At a fairly young age, maybe 13 and 14 years old, we went to a bluegrass festival on a whim with some friends and we were just blown away by the spontaneity and the passion of acoustic music. We decided the next day to quit all our classical lessons. That’s when we started the Lovell Sisters with our eldest sister in 2005 and we toured around the country for 5 or 6 years. [Jessica] decided to phase out and that’s when Megan and I committed to each other and started Larkin Poe in 2010, when we were in our early 20s. 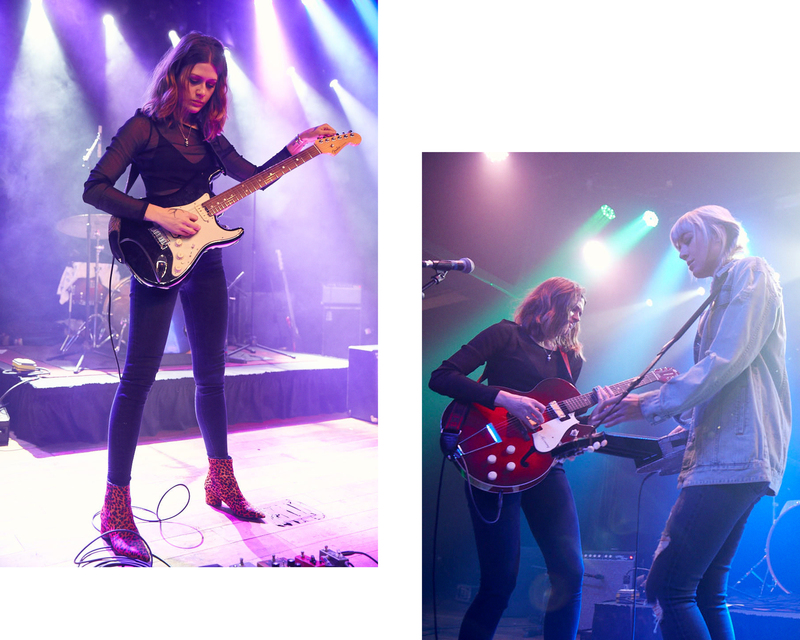 Since we started Larkin Poe, it’s been this musical extravaganza of experimentation. In the last couple of years we really found ourselves. It’s funny, it’s been kind of a lifelong journey of creative discovery and now we’ve really settled on what it means to be in Larkin Poe. With the release of Peach we really feel like we found our identity. Let’s talk about Peach—what went into the making of this album? Megan Lovell: Peach was the first project that we self-produced, and also the first album where we played all of the instruments ourselves. It was a very liberating experience where we really worked together as sisters and that allowed ourselves the freedom to experiment and the freedom to rely upon ourselves. RL: It was definitely like flights of fancy. We would have ideas that would occur to us and we would be able to, as Megan said, have the freedom to follow whatever creative path that we wanted to take in the studio, which was really so fun. And also, because Megan and I do share a lot of nonverbal communication between the two of us as sisters, we could sort of go on tangents together and have it feel really fresh and exciting and I think that people can hear that in the record. How has sisterhood affected your music? ML: Being sisters really does have an influence on the way we play and the way we interact on stage because we’ve been doing this our entire young adulthood. We never spent more than three weeks apart our entire lives! It’s really fun to perform with your sister and all of our shared experiences helps the music, I think. RL: We’re very different people…we’re like the sun and the moon to each other, but we’re always in sort of lock step orbit with one another and I think that that also is really cool in our dynamic on stage because we can look at each other and recognize one another’s instincts instantaneously. But we do bring incredibly different strengths and assets to the relationship so it is really fun…we keep each other honest, it’s kind of a check and balance. I’m not going to let her get too high and mighty, and vice versa. You have an exciting year ahead, I know you are playing some festivals and you’ve even been nominated for an award—tell us a little about what we can expect and what it feels like to have made it to this point. RL: We are really happy, as an American band, that we do have a lot of American touring on the dockett this year. We’re going to be doing some touring with some very high profile artists that has yet to be announced, we’re playing Bonnaroo again this year, we’re playing Lollapalooza. I think that we’ll likely have some more music coming out this year which is exciting…and yeah, we were nominated for a Blues Award for Peach, and that’s kind of a first time experience for us. We’re going to go to Memphis to take part in the award ceremony and we have our fingers crossed. 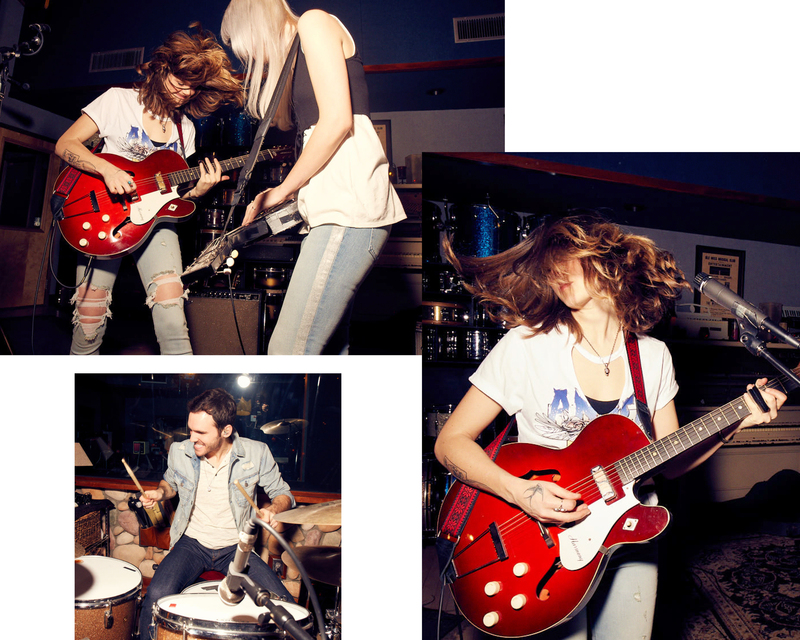 We were really excited to have you guys try out our Denim Perfect line. What role does denim play in your own lives? ML: Well, we’re definitely denim gals! To me, denim is about comfort. We’ve never been super girly-girl, we like to wear combat boots and black denim and a rock t-shirt so this Denim Perfect [campaign] definitely works for us. ML: I will say, those were the most comfortable pair of denim jeans I’ve ever worn! What’s your go-to look when you perform? RL: For me, it would definitely be a black denim, my Doc Martin boots, or I recently acquired a pair of leopard skin boots that are very exciting, with a band t-shirt. I have pretty much all of my favorite bands on t-shirts and I’ll just rock that or a muscle tee. ML: Black denim and I also have a bunch of rock tees, but my favorite is this white, distressed “Babes Ride Out” t-shirt. Babes Ride Out is this awesome festival in Joshua Tree where all these girls ride in on motorcycles and then they have this festival—it’s amazing, we played it last year—and that’s probably my favorite outfit. I read that you guys are distant relatives of Edgar Allan Poe—was including Poe in your band name important to you to have that bit of family history? RL: Having a band name that included family history was very important to us. I mean, we are sisters and trying to keep that as a touchstone for the band was something that we really thought long and hard about when picking the name. We grew up reading a lot of Edgar Allan Poe, and I think that his writing really embodies a lot of southern gothic spirit. He has beautiful imagery, but then also a deep tragedy that exists and a sort of dark undertone that, for us, really resonates. A lot of the flavor of Poe is really expressed in our lyrics so it was an important move, as sisters especially, to keep carrying on the family tradition with the name, which also happens to be a very southern thing to do—family first, always.